Whether you seek an incredible getaway with friends or a memorable family vacation, Hard Rock Hotels have it all. Adults will appreciate modern accommodations and luxury amenities, while kids will enjoy safe, fun activities and entertainment at Kids Club. Contact UNIGLOBE Travel to book today! Just off the azure waters of the Caribbean Sea, the Hard Rock Hotel Riviera Maya is nothing short of the ultimate crowd pleaser. Live it up with world-class shopping and endless style. Hit the Little Big Club™ and teen activities, or channel your inner awesome and head to Heaven — an adults-only expanse with stunning pools, lavish spa treatment rooms, and access to signature golf courses by Jack Nicklaus and Robert von Hagge. Bottom line, it's all top-shelf. 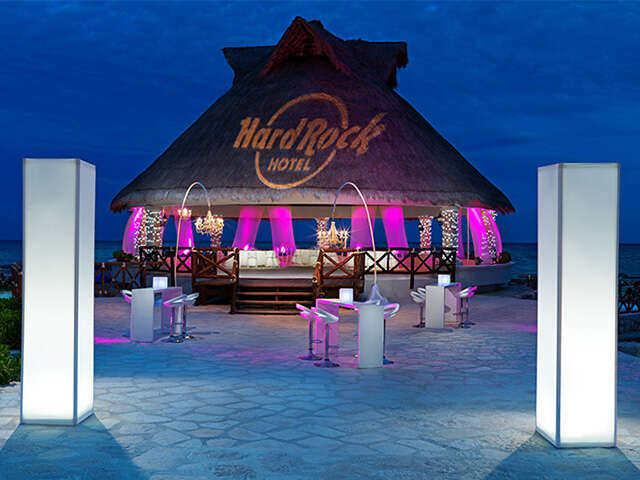 The Hard Rock Hotel & Casino, Punta Cana boasts the best casino around, exhilarating night life, tantalizing culinary options and rooms worth tweeting about, all infused with the legendary rock and roll vibe. Experience the allure of the Pacific at Hard Rock Hotel Vallarta. Situated on a wide, gold sandy beach of Bahia de Banderas in the heart of Nayarit, Hard Rock Hotel Vallarta takes everything to the extremes. Incredible views of the Pacific coast, modern amenities, all infused with the spirit of Rock 'N' Roll. *Conditions apply. Contact us for details. *New bookings only. Advance booking required. Non-refundable and non-transferable. Offer limited and subject to availability. Offer subject to change and expire without notice. Valid for up to two children ages 4-12 per room, per stay when accompanied by one full paying adult. Kids stay free offer not applicable at Hard Rock Hotel Cancun & Hard Rock Hotel Riviera Maya-Heaven Section. Reservations with overlapping dates will qualify, the discount will apply for nights within the travel window. Other restrictions may apply, contact your UNIGLOBE Travel consultant for details.